This is a diamond in the rough that I picked up for almost nothing at an estate sale recently. I saw the potential in it. It just needed a little help from Maas Polishing Creme for Metals (affiliate link). Maas doesn't stink. It takes off the tarnish with just a little "elbow grease." A dab goes a long way. It's pretty rewarding to watch the color change before your eyes. It's even better while watching a favorite episode of Downton Abbey. The sweet tray is stamped Wm A Rogers. It also still had a sticker with the name and address of the previous owner on the back. I imagine it could tell some stories. After years out of circulation, I'm sure it's glad to have its former shine back. Now it holds a collection of sentimental treasures on my night stand. Who knows? It may even get to serve some tea and sandwiches one of these days. What a great find!!! I will have to try the Maas polishing creme. Such a beautiful vignette and a great find. I love silver trays!!! 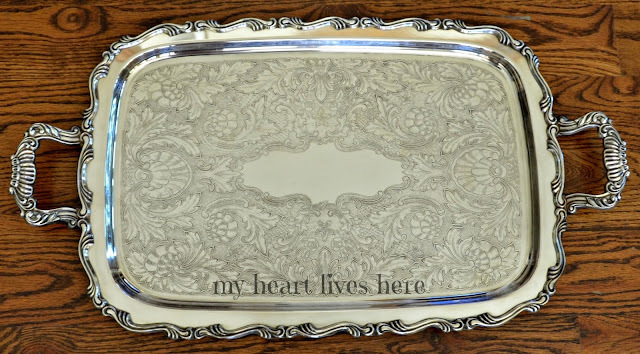 Your silver tray was a great find! Well done! Thanks for the info about Maas. Your tray is beautiful! I love polished silver. I don't like it left tarnished. It just looks dirty to me. You will get a lot of uses out of the beautiful tray. This is a glorious find, I love to search for diamonds in the rough too and then bring them back to life. You found the perfect spot for it, while it waits for your next gathering! The tray is beautiful and cleaned up so well! I love the little vignette you created with it. What a happy scene to see next to your bed everyday. 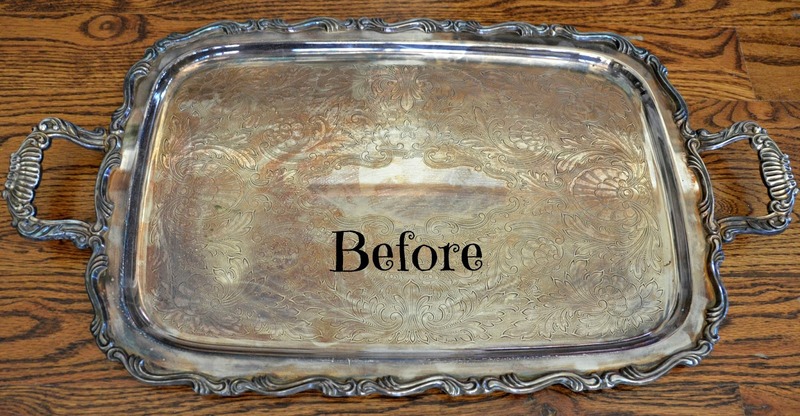 Loving your silver tray! Thats a great find thats going to give you lots of enjoyment. Oh, I love these things! I have one but, it isn't nearly this nice. Great find! Thanks for sharing at Home Sweet Home! That is a beautiful tray and display! Thank you for sharing and linking up at Dishing It & Digging It! Gorgeous find, Eilis! 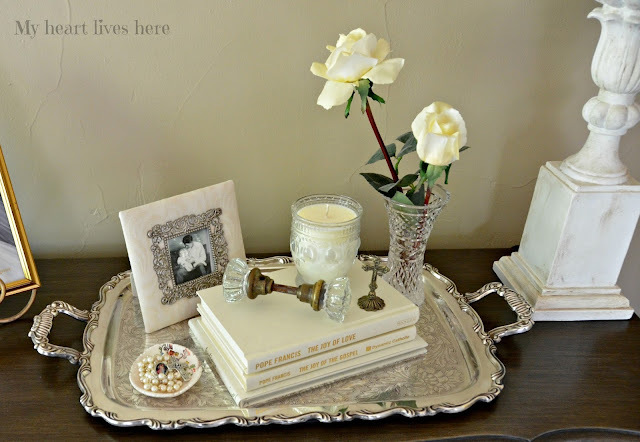 I adore silver trays.Thank you for sharing @Vintage Charm--pinning! It is gorgeous. I might have the same tray. Your blog looks great.